Download our flyer to share with your family & friends! 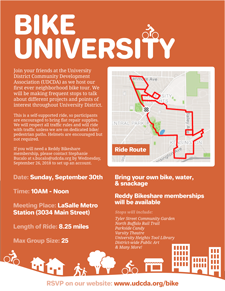 Join your friends at the University District Community Development Association (UDCDA) as we host our first ever neighborhood bike tour. We will be making frequent stops to talk about different projects and points of interest throughout University District. This is a self-supported ride, so participants are encouraged to bring flat repair supplies. We will respect all traffic rules and will ride with traffic unless we are on dedicated bike/pedestrian paths. Helmets are encouraged but not required. If you will need a Reddy Bikeshare membership, please contact Stephanie Bucalo at s.bucalo@udcda.org by Wednesday, September 26, 2018 to set up an account.